The boy would huff softly before responding in a pleading tone, desperate to hear something of the mythical world his grandmother had paraded before him time and time again, fuelling his imagination. The grandmother would then smile, soft as the wind on a spring morn, and entice him with a short but sweet tale riddled with mystery and adventure and occasionally the gore and deceit that made the excitable child pound his tiny fists against the arms of his chair or hop slightly out of pleasure. The ritual transcended time and space in the eyes of the young prince who would return to the workshop, no matter what, in order to indulge himself in his grandmother’s tales. As he grew older, the stories became less and less necessary to lure the Sandman to his door but more and more necessary to help him maintain his sanity. But with each sunrise and sunset, the elderly woman grew weaker, and eventually the time came to put her to rest. The physicians crowded her sleeping chambers one particularly frosty night and, early in the morning, the prince was made aware that his closest family member was no more. The poor lad broke into a cold sweat, traumatized by the loss. He was lost, utterly lost, and felt as if he had no where to go. When elderly woman died, the whole castle wondered of the young prince’s mental state. He was to be king of the land, to cope with the entire kingdom’s difficulties, and yet he couldn’t even cope with the death of his own grandmother, the palace seamstress. The stories were his only escape from the stresses of day-to-day life, and without his grandmother, without her tales, he felt completely alone and trapped. He knew not what would become of him or the palace as he stood in darkly-coloured garb, staring at the casket that contained the woman who’s sweet voice would blanket him every evening. “Your Highness?” The prince dragged his gaze away from the woman’s lifeless face and found that he was looking at a short and stout man he knew to be one of the palace messengers. Jerked from his thoughts, the prince followed the messenger into the private wing and listened attentively to the reading of the will. He had never realized how important the old woman was to him until she was gone. And it hurt more and more to think of her possessions being dispersed, her workshop no longer belonging to her, her cold body lying six feet under the ground. The messenger brought the small diary over to the prince and gently placed it in his hands. The blonde king-to-be ran his fingers down the spine and slowly pried it open to see pages and pages coated with words, beautiful words. 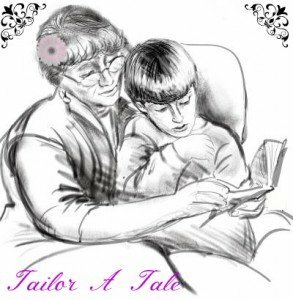 On the last page brimming with black ink, it read in legible cursive, “Now tailor for me a tale.” And he vowed to do just that. Sana Hameed is a teenage writer who injects a bit of herself and her experiences into each story she tells.